The main concepts behind my sculpture are impossibility and childhood. As we grow older, we often forget about small things, and regress to childhood when such objects are presented in adulthood. In a world where we are forced to grow up, why should we not be able to play with childhood toys? My sculpture is a part of these questions; childhood and impossibility. My work presents a three foot tall wooden Jenga tower, partially played, surrounded by a large crowd of miniature clay figures. The processes used included cutting, moulding and sanding. I was initially inspired by the work of Nic Joly, and his pieces Why Not? (Joly, 2015), and London Calling (Joly, 2017). These are highly detailed pieces depicting a story between giant and miniature, through the use of miniature clay figures. From this, I began to experiment with clay, wire, and paper to create miniature figures. This led me to the work of Antony Gormley, Field (Gormley, 1991), a room filled with small handmade terracotta figures. This inspired me to create a large number of clay figures for the sculpture. Gulliver’s Travels, a 1726 book (Swift, 1726), and a 2010 film (Gulliver’s Travels, 2010), and The Borrowers (The Borrowers, 1997), further informed me of ways in which miniature figures interact with their larger environment, and connected me back to my childhood. In my own work, I wanted a significant size difference between the figures and Jenga tower. This surrounds the theme of impossibility as the sculpture is a 1:50 replica of a playable Jenga tower, the blocks inspired by Debuilding, Aurelien Froment (Froment, 2001). This would be impossible to play at the larger size, as the pieces would be difficult to move, and a hazard if played too high. The inspiration came from Claes Oldenburg, and his vision to create impossible sculptures, including bowling balls down Fifth Avenue (Oldenburg, n.d.). Through the use of giant versus tiny, I want the viewer to interact with the piece, to bend down, to view it closely, and to think about smaller things in life. In addition, I wanted each figure to be plain and inanimate with minimal detail, showing we are all the same in society. However, each figure is handmade, and gives the sense of individual personalities, and connection to a community, all with the same fear of the impeding fall of the Jenga tower. 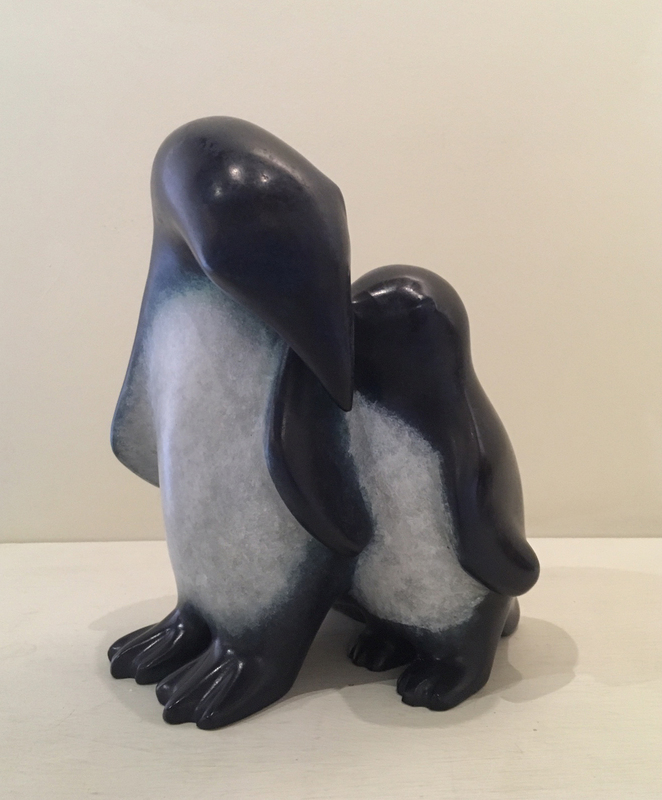 A lack of identity with a contrast of large personalities comes from the inspiration of Antony Gormely, Field (Gormley, 1991), and Anita Mandl, with her simplified animal forms Young Elephant (Mandl, n.d.), and Little Blue Penguin (Mandl, n.d.). Not only do these miniature figures interact with the Jenga tower, but also of those pieces displayed around, and allows the viewer to interact closer these. My piece presents ideas about the illusion of impossibility and the connection to childhood through the contrast of size and displaying on the floor. The sculpture depicts a giant, half played wooden Jenga tower, surrounded by miniature clay figurines. The contrast between the size of the blocks, tower and figures distinguishes the impossibility of the project in a real size. Displaying on the floor regresses the viewer to childhood. Froment, A., 2001. Debuilding. [Art]. Gormley, A., 1991. Field. [Art] (Tate Liverpool). Gulliver’s Travels. 2010. [Film] Directed by Rob Letterman. Ireland: Davis Entertainment; RatPac-Dune Entertainment. Joly, N., 2015. Why Not?. [Art] (Castle Galleries). Joly, N., 2017. London Calling. [Art] (Castle Galleries). Mandl, A., n.d. Little Blue Penguin. [Art] (Curwen Gallery). Mandl, A., n.d. Young Elephant. [Art] (Curwen Gallery). Oldenburg, C., n.d. Untitled. [Art] (Frieze). Swift, J., 1726. Gulliver’s Travels. 1 ed. s.l.:s.n. The Borrowers. 1997. [Film] Directed by Peter Hewitt. United Kingdom: Working Title Films. Through the piece ‘Debuilding’ (2001), Aurelien Froment invites people to build Jenga-like structures using wooden blocks of varying sizes. 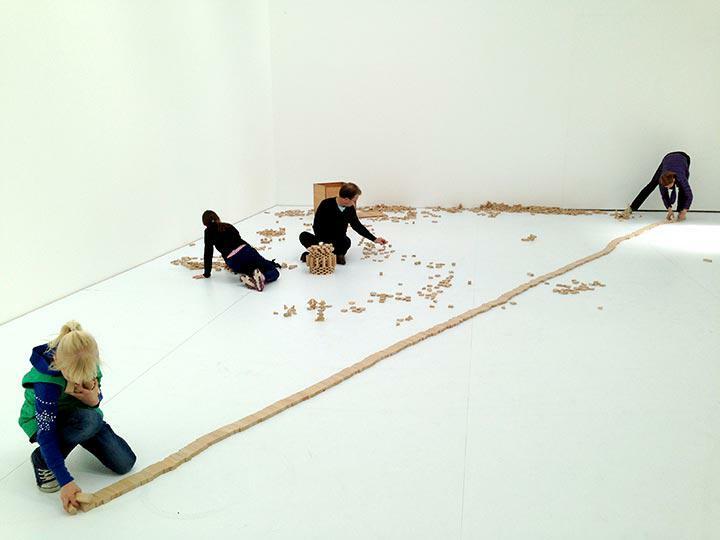 Initially stacked inside a single wooden trunk in the corner of the gallery, the blocks have since been scattered across the white floor by participants eagerly engrossed in the process of building their own imaginary dwellings, vehicles and towers. Like Neuenschwander’s ‘[‘]’, this work will also endure, because each creation is carefully disassembled by gallery staff every evening, ready to be reconfigured anew by visitors the next day. The first edit of my artist statement for the sculpture project started off very well, but ended very rough. I used my previous Artist Statement as a guide of how to write this one, as I liked how I expressed my thoughts and ideas for the painting. This was a rough plan because I was unsure as to who my main influences are at that certain point in time. So when I developed my piece further, I was able to choose who my main influences are, and further develop my artist statement. The main concepts behind my sculpture are impossibility and childhood. As we grow older, we often forget about the small things, and possibly regress back to childhood when such objects are presented in adulthood. In a world where we are forced to grow up, why should we not be able to play with giant Jenga? My sculpture is a part of this question, between childhood and impossibility, and encapsulating these moments. My work presents a three foot tall wooden Jenga tower, partially played, and surrounded by a large crowd of miniature clay figures. I was initially inspired by the work of Nic Joly, and his (Name piece of work). These are highly detailed pieced depicting a story between the giant and the miniature, through the use of miniature clay figures. From this work, I began to experiment with clay, wire, paper and plastic, in order to create miniature figures. This led me to the work of (rough artist) and the pieces of (name) and (name). Gulliver’s Travels, a 1726 book, and a 2010 film, further informed me of the positions… that I wish to recreate. In my own work, I wanted to have… (mention the link between the size of the sculpture and the impossibility – mention the influence of Claes Oldenburg). As the sculpture began to grow and I further gained idea of what I wanted to achieve, I further improved and typed over the artist statement bullet points that I first had (as seen above). I came up with this statement, however I am going to get people to read over this to ensure that it is coherent, and also gets my viewpoint across of what the sculpture is trying to achieve. My work presents a three foot tall wooden Jenga tower, partially played, and surrounded by a large crowd of miniature clay figures. The processes used to create these included cutting, moulding and sanding. I was initially inspired by the work of Nic Joly, and his pieces Why Not? (Joly, 2015)and London Calling (Joly, 2017). These are highly detailed pieced depicting a story between the giant and the miniature, through the use of miniature clay figures. From this work, I began to experiment with clay, wire, paper and plastic, in order to create miniature figures. This led me to the work of Antony Gormley and the piece Field (Gormley, 1991), a room filled with small terracotta handmade figures, to inspire me of the number of clay figures that needed to be created for the sculpture. Gulliver’s Travels, a 1726 book (Swift, 1726), and a 2010 film (Gulliver’s Travels, 2010), and The Borrowers (The Borrowers, 1997), further informed me of ways in which miniature figures interact with their larger environment, and connected me back to my childhood, when these films would be watched. In my own work, I wanted to have a significant size difference between the miniature figures and the Jenga tower. This surrounds the theme of impossibility as I intended the sculpture to be a 1:50 replica of a real life, playable Jenga tower. This would be impossible to play at this size, as the pieces would be unable to move, and would become a hazard if played too high. This came from the inspiration of Claes Oldenburg, and his vision to create impossible sculptures, including bowling balls rolling down Fifth Avenue (Oldenburg, n.d.). Through the use of the giant versus the tiny, I want the viewer to interact with the piece, to bend down and to view it closely, and for them to think about the smaller things in life. In addition, I wanted each figure to be plain and inanimate, to show that we are all the same in society. However, this lack of detail and the way in which each figure is handmade, gives the sense that they each have personalities, and these personalities gives connection to a whole community, all having the same fear of the impeding fall of the Jenga tower. This sense of a lack of identity, but a large personality comes from Antony Gormely, Field (Gormley, 1991), and Anita Mandl, with her simplified animal forms Young Elephant (Mandl, n.d.) and Little Blue Penguin (Mandl, n.d.). Not only do these miniature figures interact with the Jenga tower, but also of those pieces displayed around, as this allows the viewer to interact closer to these pieces. My piece presents ideas about the illusion of impossibility and the connection to childhood through the contrast of size and the display on the floor. The sculpture depicts a giant, half played wooden Jenga tower, surrounded by miniature clay figurines. The contrast between the size of the blocks, tower and figures distinguishes the impossibility of the project in a real size. The display on the floor reverts the piece, and the viewer, back to childhood. I thought this next version would be the final artist statement, until I realised it was around 100 words over the word limit – something I couldn’t just ‘accidentally’ miss, and so the shortened version of this, the final version, can be seen on Artist Statement. My work presents a three foot tall wooden Jenga tower, partially played, and surrounded by a large crowd of miniature clay figures. The processes used to create both the Jenga tower and figures included cutting, moulding and sanding. I was initially inspired by the work of Nic Joly, and his pieces Why Not? (Joly, 2015) and London Calling (Joly, 2017). These are highly detailed pieces depicting a story between the giant and the miniature, through the use of miniature clay figures. From this work, I began to experiment with clay, wire, paper and plastic, in order to create miniature figures. This led me to the work of Antony Gormley and the piece Field (Gormley, 1991), a room filled with small terracotta handmade figures. This inspired me to create a large number of clay figures that are needed for the sculpture. Gulliver’s Travels, a 1726 book (Swift, 1726), and a 2010 film (Gulliver’s Travels, 2010), and The Borrowers (The Borrowers, 1997), further informed me of ways in which miniature figures interact with their larger environment, and connected me back to my childhood. In addition, I wanted each figure to be plain and inanimate with minimal detail, to show that we are all the same in society, and we are part of a wider society. However, the way in which each figure is handmade, gives the sense that they each have personalities, and these personalities gives connection to a whole community, all having the same fear of the impeding fall of the Jenga tower. 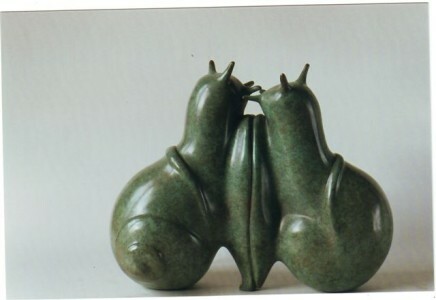 A lack of identity with a contrast of large personalities comes from the inspiration of Antony Gormely, Field (Gormley, 1991), and Anita Mandl, with her simplified animal forms Young Elephant (Mandl, n.d.) and Little Blue Penguin (Mandl, n.d.). Not only do these miniature figures interact with the Jenga tower, but also of those pieces displayed around, and allows the viewer to interact closer these other pieces. My piece presents ideas about the illusion of impossibility and the connection to childhood through the contrast of size and the display on the floor. The sculpture depicts a giant, half played wooden Jenga tower, surrounded by miniature clay figurines. The contrast between the size of the blocks, tower and figures distinguishes the impossibility of the project in a real size. By displaying on the floor, this draws the viewer back towards their childhood. Diana Armfield works in many mediums including that of pastel, watercolour, printmaking and drawing. The drawings that she creates are left very rough, but still distinguishable, with many lines and layers, creating her image. In the two drawings that the Curwen Gallery display, Diana has draw the subjects of a flock of sheep, both in a field and from the view of a window. Both of these are drawn in a similar, rough style. Although the style could determine the piece to be to difficult to view, Diana has ensured that her pencil marks do not confuse the viewer, but instead, ensures that a somewhat manic marking process, is made into a coherent drawing piece. 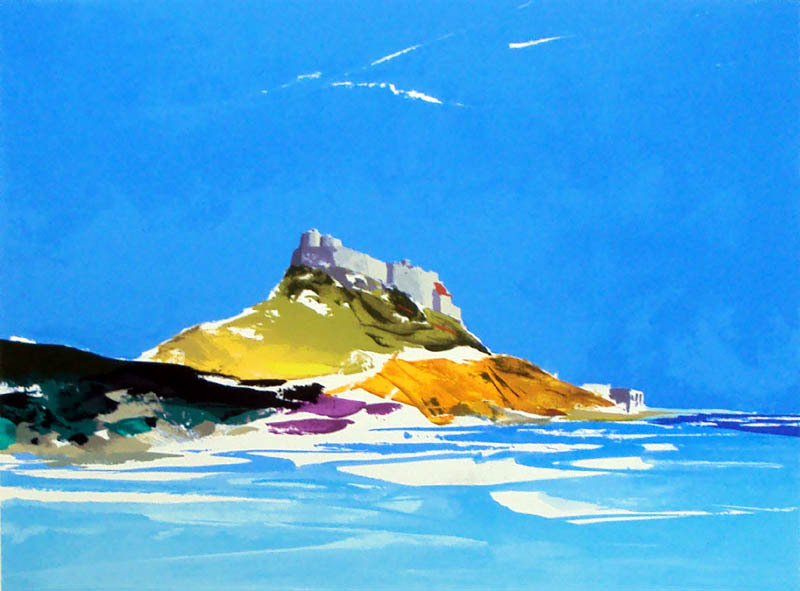 Donald Hamilton Fraser has exhibited around the world, while also being made a Fellow of the Royal College of Art in 1970, Honorary Fellow of the Royal College of Art in 1983, and then elected Royal Academician in 1985. His paintings are composed of the sea, in block and contrasting colours. The sea itself, in many of his paintings, the sea is represented by only two or three variations of blue, and contrasted against the sky, which is another blue entirely. The seascapes and other landscapes that he paints are very vivid, only using light and bright colours, with very little use of darker colours, and almost no use of black at all. These colours create a warm, and calm atmosphere within each of the paintings. These colours are only used in block, and are rarely mixed in with one another. This use of blocking colours adds a level of simplicity to each of the paintings. The simplicity, and the calm atmosphere couple to create soft and smooth paintings of seascapes. 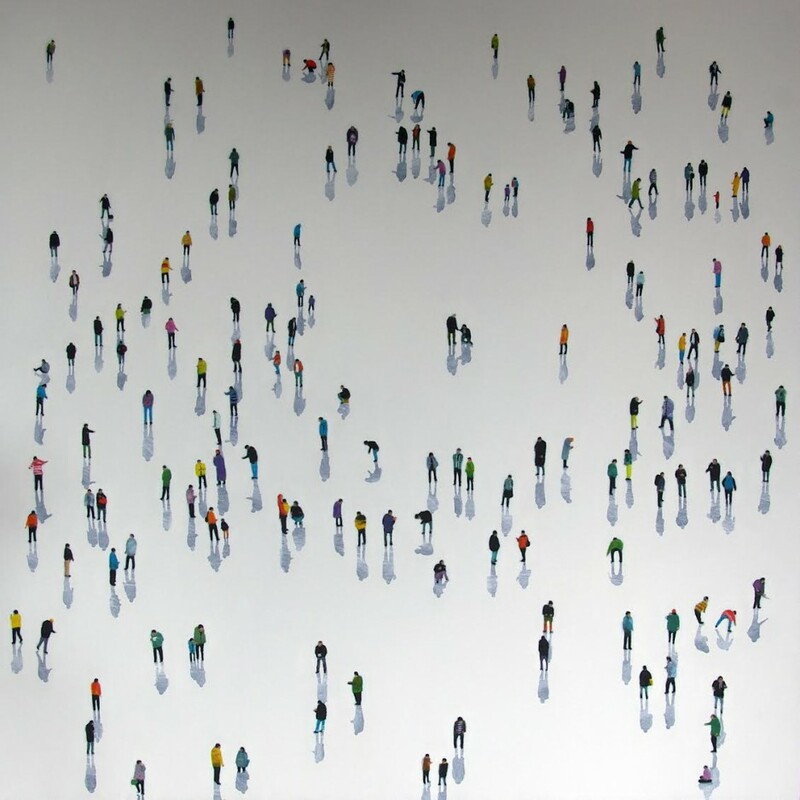 Henry Walsh is a London full time freelance artist and designer, who concentrates a large portion of his time on oil painting. 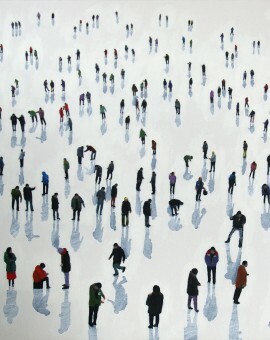 The majority of his paintings look at people from different perspectives, namely from birds eye view. 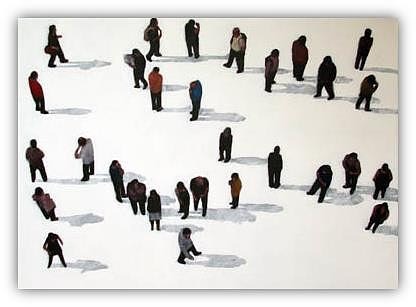 This different perspective of large amounts of people allows the viewer to see just how small we are in the world. What is somewhat strange in each of these, is that there is no reference between person and object. 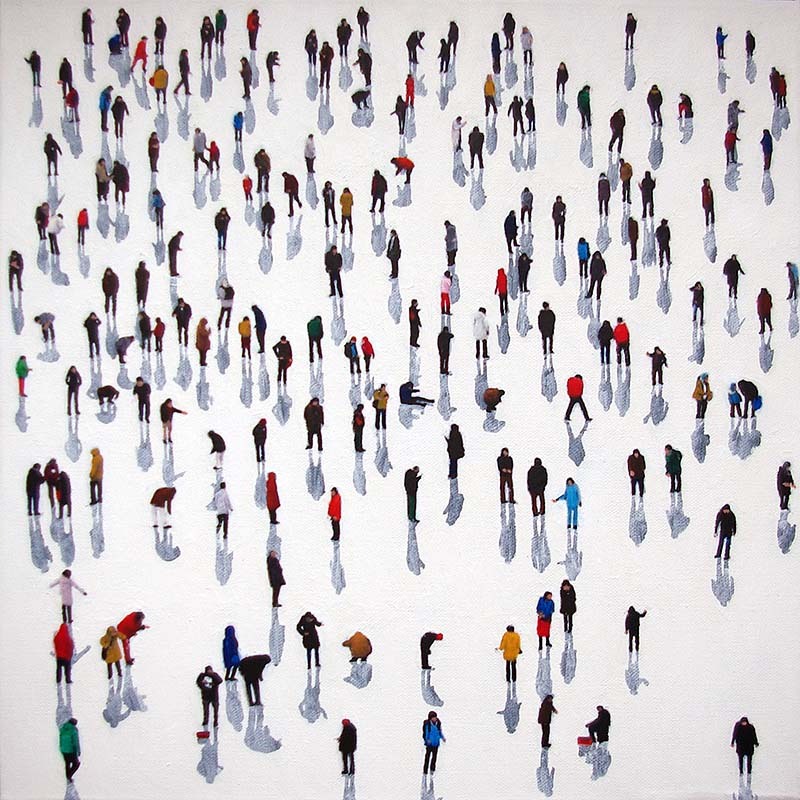 For this reason, it is unclear to the viewer whether these people are painted small, or this is the size of these people. 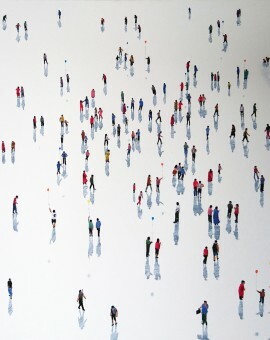 There is also a high level of detail on each figure that Henry Walsh paints – each figure is painted with clothes, some carry umbrellas or walking sticks, and others play with children. 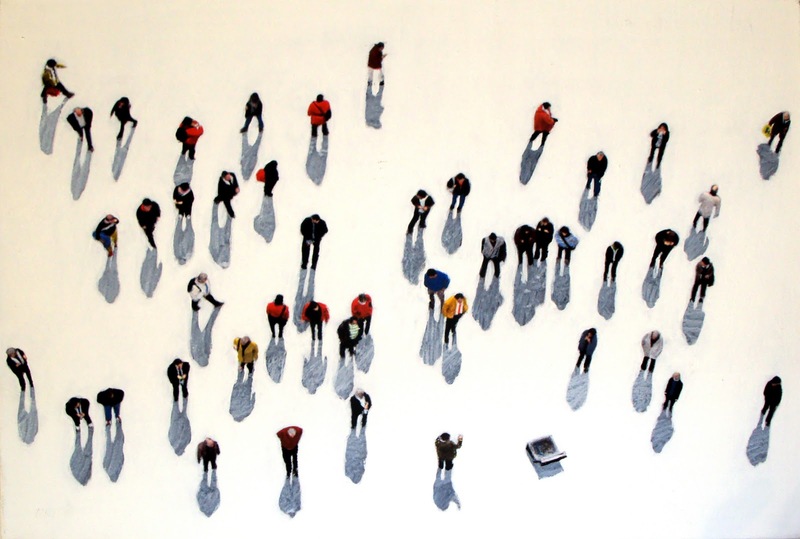 A small community is created within each painting, without any specific details of individuals. Anita Mandl was trained as a zoologist, and soon become a member of the teaching staff of the Medical School at the University of Birmingham, while attending evening classes in sculpture at the Birmingham College of Art. 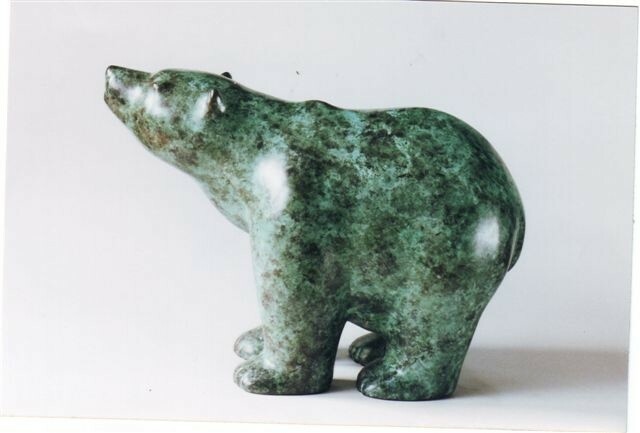 The sculptures that she creates are mostly simplified animal forms, along with highly polished surfaces. Each sculpture is made with dedication, with no sharp edges or hard creases in the stone or marbles. This allows for the smooth surface and simple forms of each animal created. She first started making carvings in hardwood, but soon began to explore the mediums of alabaster, soapstone and marbles. 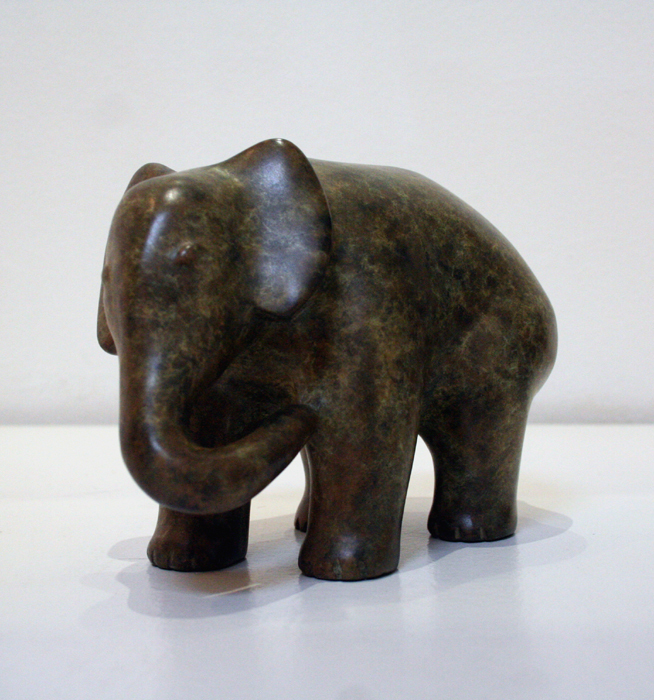 All of the bronze sculptures are cast from original carvings, and since 1987, have been cast and patinated by Pangolin Editions.